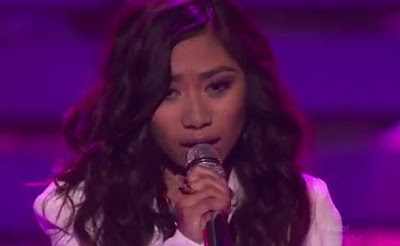 Jessica Sanchez performed her winner's single "Change Nothing" on American Idol Season 11 Top 2 Finale Performance Show. Let's help save Jessica from elimination. In the US, you can vote for Jessica Sanchez by calling 1-866-IDOLS-01, 03 or 07 (1-866-436-5701, 1-866-436-5703, 1-866-436-5707) or Text “VOTE” to 5701, 5703 or 5707. If you have Magic Jack or NetTalk phones in Pinas, you can vote for Jessica by dialing the toll free number that will be assigned to her after the American Idol show. Check the American Idol website or Jessica Sanchez facebook http://www.facebook.com/pages/Jessica-Sanchez/51158140363 to find out the toll free number she got for that episode. You have 2 chances to vote: 10am-12noon and 1pm-3pm on Thursday Manila time. If you get busy tone (try at least twice to be sure) on the first time slot, that means your Magic Jack or NetTalk phone has a West Coast number, so trying dialing on the second time slot (1-3pm). You can vote as many times as you want via dial method. If you get a busy tone, it means the voting is closed. You can also try dialing from your computer using Skype for free. If you got busy tone on the first time slot, try the second time slot. If you have Skype app on your smartphones, that should work too.